The National Register of Historic Places Registration Form (Nomination Report) represents the end of a four-year collaborative effort between Henrico and the Commonwealth of Virginia to survey over 1300 resources within 1400 properties and evaluate the historic nature of Highland Springs. 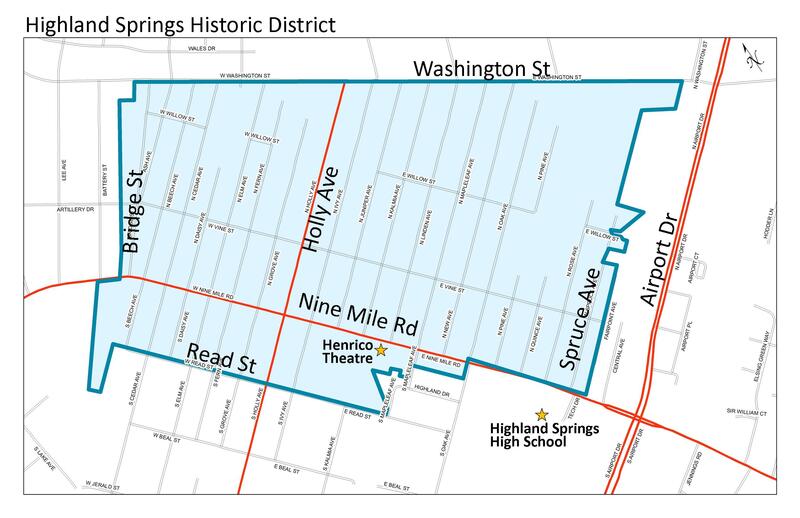 Just over 1,000 buildings and other resources were found to be contributing to the Highland Springs Historic District, which has a period of significance of 1890 to 1969. The District was added to the Virginia Landmarks Register and the National Register of Historic Places based on its eligibility in the area of Community Planning and Development as an excellent example of an intact late-19th-century streetcar suburb of Richmond and for its collection of well-preserved houses in a variety of vernacular and definable styles dating from the late 19th century to the 1960s. The Highland Springs nomination report (large document) contains a detailed history of Highland Springs and its development as well as photos of typical examples of architectural styles found in the district, historic photos and maps of the area. Showing building outlines and whether the property has been determined to be “contributing” or “non-contributing”. Shows the age of properties in the district. Learn more about Henrico historic preservation, County historic sites, and how to obtain plaques commemorating historic structures including those in the Highland Springs Historic District. Learn more about historic resources in Virginia and other services available from the Virginia Department of Historic Resources. The Henrico County Department of Community Revitalization administers several neighborhood revitalization programs, including housing improvement programs, grants to assist businesses in the Enterprise Zone, and enforcement of environmental and zoning codes.